Google’s flagship Pixel 3 series was unveiled last month and the mid-range smartphone that we had all been expecting didn’t make an appearance at the launch. However, the Pixel 3 Lite, codenamed Sargo, made its first appearance online last week and we have now been treated with another look at the device. 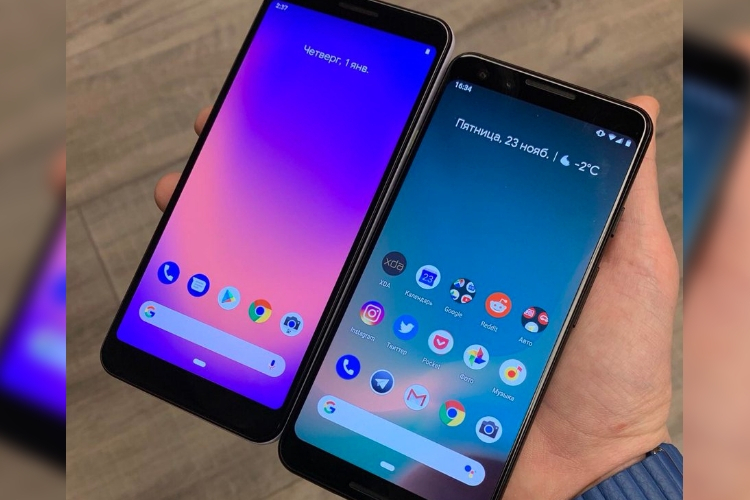 The Pixel 3 Lite has now surfaced online, via Twitter user kzkv of Wyslacom Media, and we’ve got the device sitting right next to its similarly-sized flagship brother – the Pixel 3. The Pixel 3 Lite, if you cannot make out, is the one on the left and sports only a single speaker up-top. No stereo sound here, well, because of cost-cutting! You can distinctly see in the image above that the devices have a different height and width, which is due to the inclusion of a rumored 5.56-inch IPS display with an 18.5:9 aspect ratio in comparison to the 5.5-inch 18:9 AMOLED panel on the smaller Pixel 3. As for other hardware specifications, the Pixel 3 Lite is expected to be powered by Snapdragon 670 chipset, coupled with 4GB RAM and 32GB of internal storage (which would be disappointing, if it’s the only variant). The phone, as leaked previously, will be bringing along a 12MP rear-camera, along with an 8MP selfie snapper. It will run Android 9 Pie out-of-the-box, with all of the new Pixel features (obviously) and also has a 2,915mAh battery that’s enclosed in a plastic body, unlike the glass enclosure on the flagship Pixel 3. Since the leaks show-off Pixel 3 Lite devices with dog-food level software and plausible hardware, the “Sargo” device could be coming soon to developing markets like India to rival budget flagships, those from OnePlus, and Xiaomi, by touting its camera prowess. So, do you think these Pixel 3 Lite leaks are real? What are your expectations from the device based on the leaks? Let us know in the comments below.